The REV’IT! 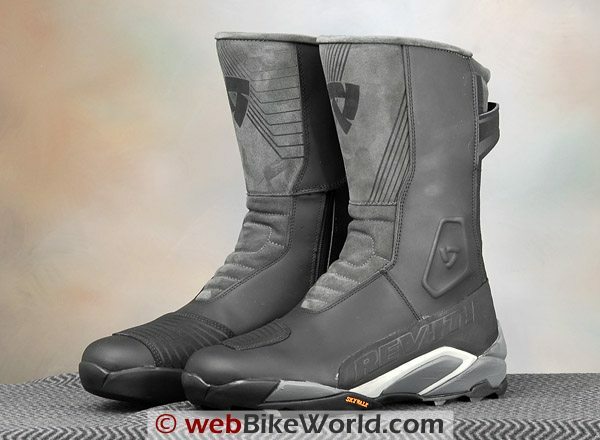 Apache boots are a mashup of motocross boots, trail running shoes, race boots and touring boots. They are a perfect match for adventure-touring, touring, enduro riding and other endeavors. 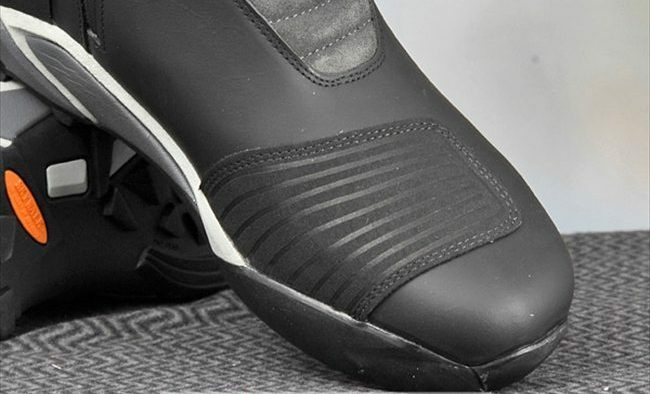 They offer excellent protection and sole grip on road and off, while still allowing the rider to walk with relative ease once the destination is reached. This is the fourth in a series of reports covering some of the new REV’IT! motorcycle clothing line for 2008. The reviews include the brand new REV’IT! Sirocco jacket (review) mesh 3/4-length jacket and the Cayenne Pro jacket (review), which is an update on the original Cayenne jacket. Also, the Cayenne Pro pants (review), the perfect match for the Cayenne jacket and a nice pair of all-around pants in their own right. This time, I’m reviewing the new-for-2008 REV’IT! Apache boots, which I described in my Apache Boots First Look report from the 2008 Powersports Dealer Expo in Indianapolis back in February (report). I’ll finish up my final REV’IT! 2008 Dealer Expo report in a week or so with reviews of the REV’IT! Air Blend and Fighter short-height boots. Those to are almost identical, except the Fighter boots are waterproof and the Air Blend boots are designed for warm-weather riding. REV’IT! currently offers such a huge number of products that it’s been nearly a non-stop job since February just trying to describe the few that I saw at the show! The REV’IT! Apache boots are not the first full-sized boots offered by REV’IT!. We reviewed the REV’IT! Jade Boots in February 2008 and the REV’IT!! Fusion Boots (review) in July of 2005. Including the Apache, REV’IT! 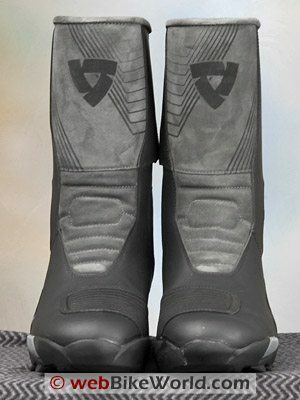 now has 9 different styles of motorcycle boots in their current lineup! But the Apache boots represent a new direction for design and style. After seeing them at the Dealer Expo and after wearing them for a couple of weeks, I’m finding it hard to categorize them in normal motorcycle boot parlance. Are they race boots? 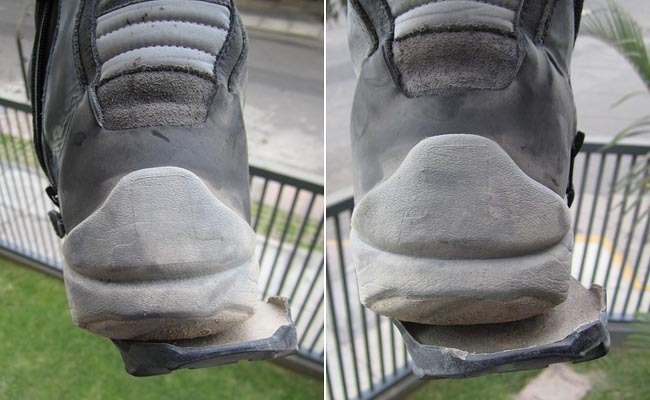 Well, they do have some race boot features, but what about those soles? 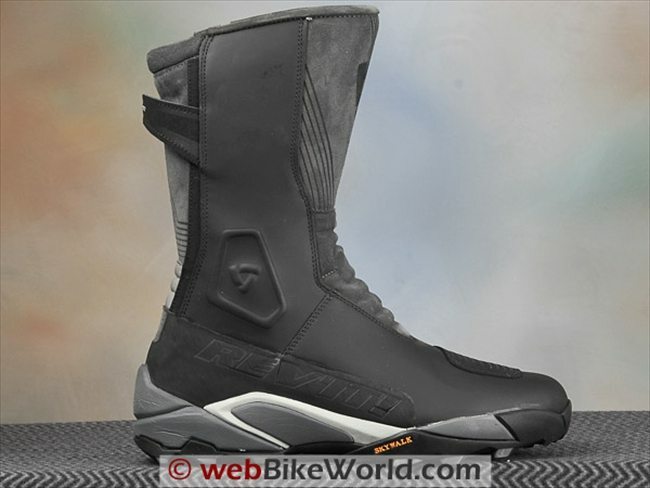 Are they adventure/motocross boots? No, motocross boots are tall and stiff and clunky, and adventure boots have those big straps across the sides, no? Are they hiking shoes? 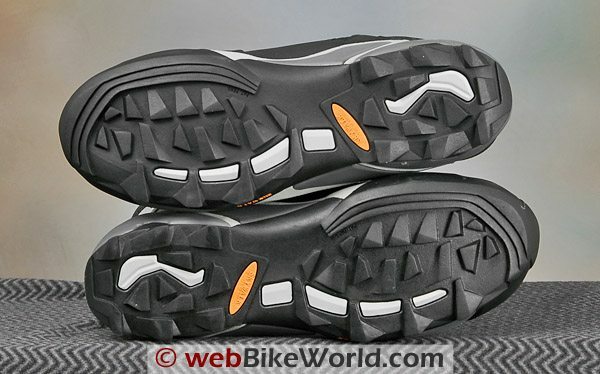 Certainly not, but the “Skywalk” soles look like hiking boots and the way the soles are attached to the uppers and the cushy padding inside looks and feels more like trail running shoes than motorcycle boots. 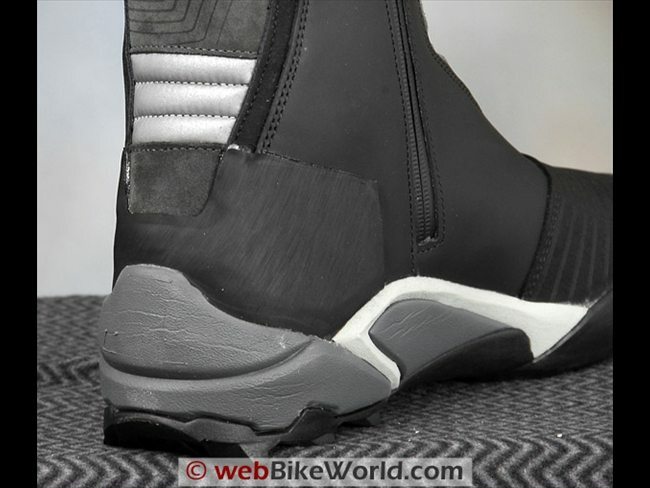 There just doesn’t seem to be a category or label that I can think of that adequately describes the Apache boots, so I’m making one up: the Apache boots are the first motorcycle mashup boots! Mashup is a term used by DJ’s to describe a new piece of music made by mixing up existing tracks. It’s also used by IT and web geeks to describe a “web application that combines data from more than one source into a single integrated tool”, according to Wikipedia.. So the Apache boots are a mashup of race boots, motocross boots, adventure boots and they even have a little bit of hiking boot thrown in! REV’IT! may or may not disagree with me, but it sure seems to me that the Apache boots are targeted at a specific type of motorcycle owner. Many REV’IT! customers are owners of adventure-touring bikes like the BMW R 1200 GS (report), the Ducati Multistrada (report), Yamah Tenere, Honda Transalp and I’ll bet some Moto Guzzi Stelvio (report) owners as well. These are usually some pretty discriminating buyers, who will appreciate the features that make up the Apache design. REV’IT! did have a something different in mind when they created the Apache boots, according to Jordan Levitt, the Director of U.S. operations for REV’IT!. He gave me the grand tour of the 2008 REV’IT! lineup at the Dealer Expo back in February. 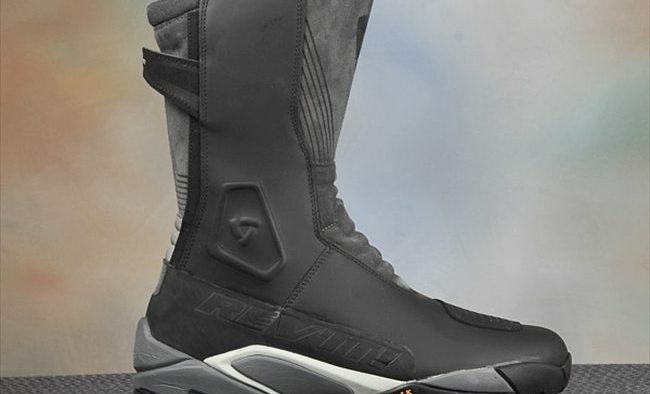 Most adventure-touring riders don’t want or need all-out, hard-core motocross boots, but they do need a rugged all-around boot that will allow them to get through some off-road terrain when necessary. But they also need to walk or hike with relative comfort when they get to their destination. REV’IT! says the Apache boots are a “new style of riding boot that combines the functions of a high quality touring boot with a semi-off-road sole”. 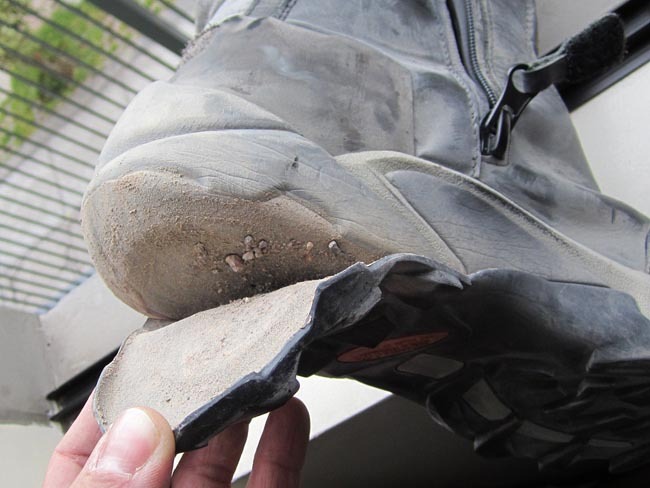 And this is reflected in the Apache boots with a very hefty lugged “Skywalk” brand sole, which not only grips well on road surfaces, it also provides excellent grip off-road and on sandy or loose gravel surfaces. Skywalk soles are well-known and well-regarded by hikers and climbers for offering outstanding grip in difficult conditions but with more comfort than Vibram soles. To make walking even more comfortable, the soles are attached to the uppers with a bonded cushion that looks and feels just like it came from a pair of trail running shoes. 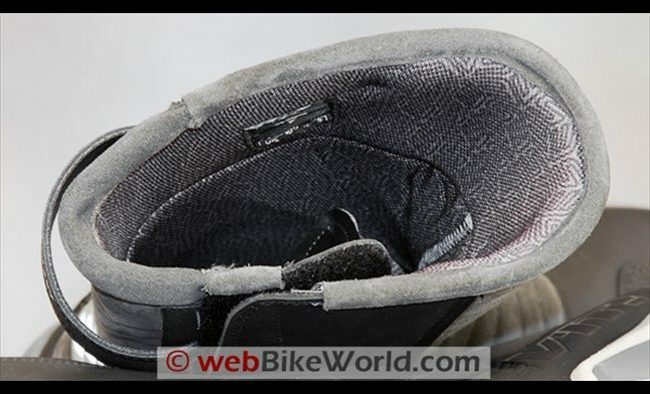 But although the sole is surprisingly comfortable for walking in a boot of this type, it also provides a good platform for standing on the pegs of an adventure-touring bike. 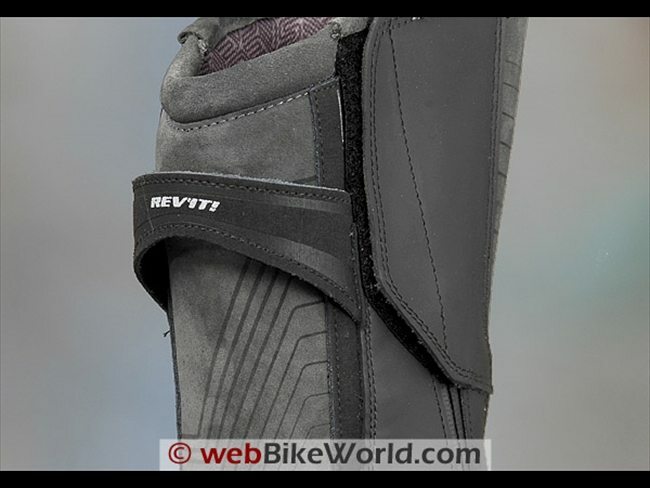 It’s certainly not as stiff as an all-out motocross boot, but the ability to do well at both walking and riding is commendable. 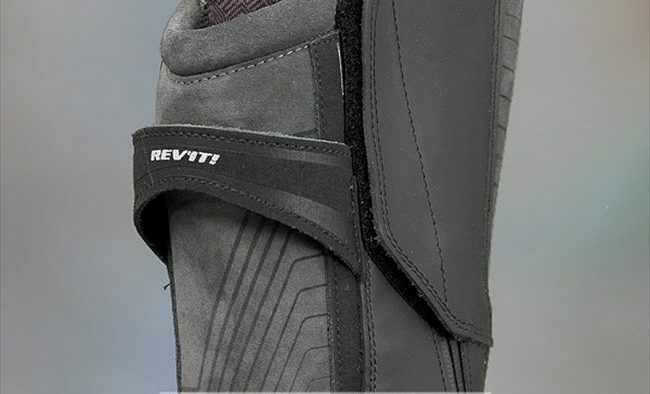 The boots are made from a combination of full grain leather, suede leather and something called Pampas leather, which is a very thick type of leather that is also used in the REV’IT! Inferno gloves (review) and in other heavy-duty applications. This combination does feel pretty hefty, so these babies should last for a long time, although they’re almost too pretty to get dirty! But even with all the heavy leather and features, the Apache boots are also relatively light. The size 44 boots shown here weigh only 861 grams (1 lb., 14-3/8 oz.) each, which is much lighter than some regular street boots I own. The Apache boots are waterproof, using the standard REV’IT! Hydratex waterproof membrane which is also supposed to be breathable. I will say that in the recent 85-90 degree Fahrenheit summer weather, the Apache boots don’t feel cool, but I suppose nothing does, including some of the vented varieties I own. Perhaps REV’IT! will develop a hot-weather version of the Apache boots to go with the REV’IT! Sirocco mesh jacket (review)? The Apache boots include all of the expected protection goodies, like ankle cups, reinforced heels and very stiff and thick shin protectors, sewn in under the leather. 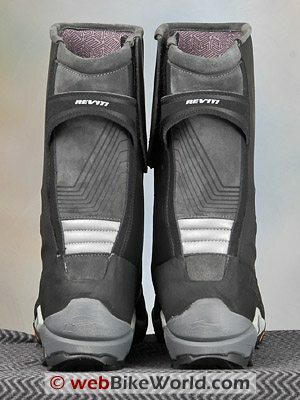 The zipper is on the outside of the boots, and it features a waterproof gusset underneath and a Velcro fastener at the top. 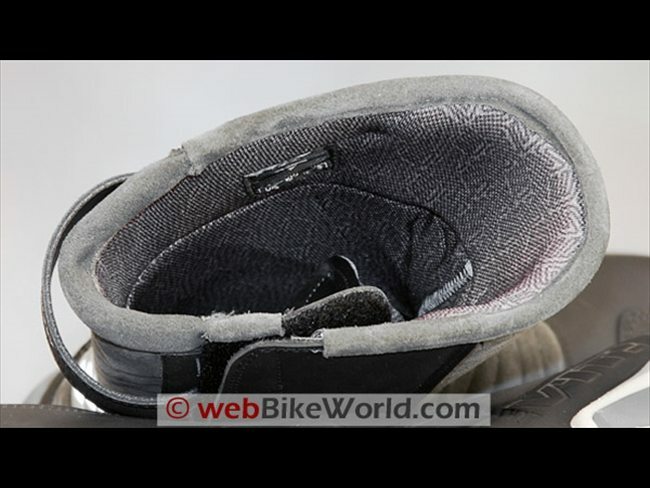 The zipper has a large pull with a Velcro section at the tip, so it holds on to the top of the boot and it’s hidden under the flap when it’s shut. The size 44 Euro boots shown here fit me as expected — I wear a size 10 to 10.5 U.S. men’s street boot. The toes are slightly more cramped than I’d like — the REV’IT! 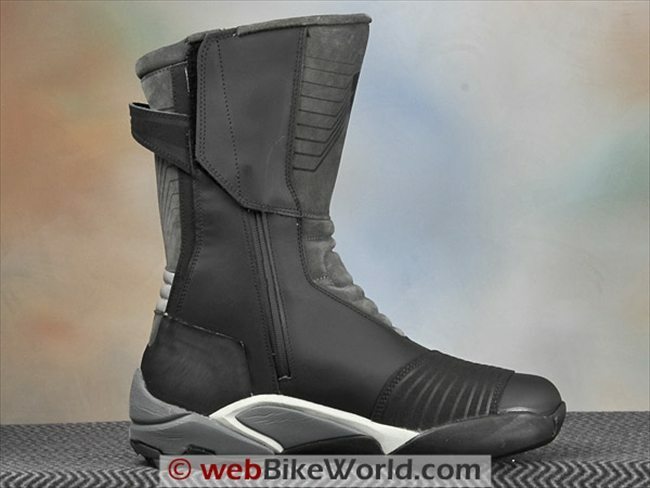 Fighter and Air Blend short boots I’m also in the process of evaluating have a nice, boxy and roomy toe which I prefer. But I’m kind of fussy about that and a narrower toe might not bother others. The boots are very comfortable though — they feel stiff at first, as high-quality, thick leather motorcycle boots do, but they are breaking in rather nicely. I can wear them over or under my motorcycle pants as desired. 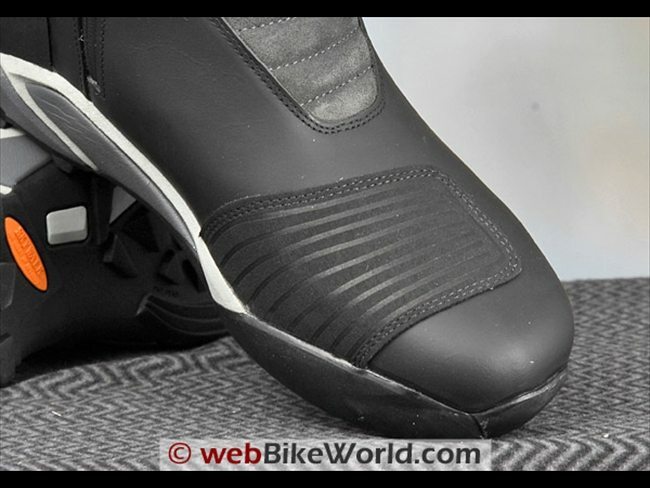 Each Apache boot also has a nice, big toe shift patch and sections of reflective material are included in the rear. The styling and the construction and quality are all first-rate — as I mentioned, the boots look great and it’s a shame to get them dirty, but they can definitely take it! The Apache boots are a mashup of motocross boots, trail running shoes, race and touring boots, and they serve a variety of purposes very nicely. 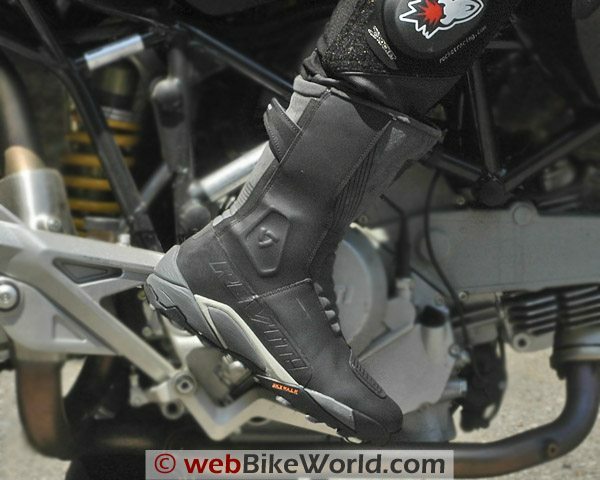 They’re probably the most comfortable full-sized motorcycle boots for walking that I’ve tried, and the soles provide outstanding grip, which is important whether you’re riding on- or off-road. They aren’t cheap, but they should last a long time and since they serve a variety of functions, they may actually end up saving you money. From “K.M.S.” (January 2012): “As you are always concerned about motorcycle products I wanted to show to you what happens with my REV’IT! Apache boots when I ride, south of Peru, to see the Dakar rally last weekend. I have sent my complaint to the store and also to REV’IT! in Europe; let’s wait and see what they have to say about it. I just drove to a place to watch the rally and I was standing about three hours, (it was) there that the soles (became) unglued (or the glue get melted — it was like bubble gum really). It was very hot out there, but boots of this quality and price should have remained intact (as all the boots and shoes from everybody around me). I just have received the answer from them: For me, a really cheap answer from a company as REV’IT!.